IN SEPTEMBER last year, China halted shipments of rare earth metals, crucial for the manufacture of everything from guided missiles and hybrid cars to flat-screen televisions and BlackBerry phones, to Japan over a territorial dispute. It also cut down its export quota for rare earth by 72 per cent for the second half of 2010. In 2011, the quota was reduced by 35 per cent for the first half. 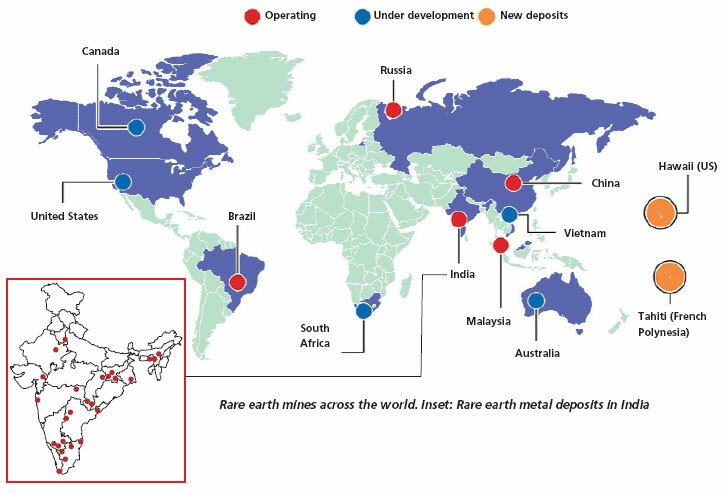 China possesses one-third of the world’s known deposits of rare earth metals and contributes 97 per cent of the global production. So, the move sent shockwaves in the hi-tech industry and boosted metals’ prices. “They (rare earth metals) are valuable because they are stable at high temperatures in which electronic devices operate,” says Alastair Neill, president, of Rare Earth Industries Ltd, a private British Columbian corporation. Alarmed by the situation, countries looked for ways to tackle the monopoly. Japan has been the most proactive. The country is devoid of any economically viable deposits of rare elements and consumes three-fourths of China’s export. It has found that sea mud is a good source of rare earth metals. Scientists at the University of Tokyo drilled holes at 78 sites across the Pacific Ocean, and collected 2,000 samples of sediment from the deep seafloor. They found that the mud in the eastern South Pacific, west of Peru and Ecuador, and in the central North Pacific, near Hawaii, had rare earth deposits twice that of China. The seafloor west of the Hawaiian islands had moderate reserves while places off the coast of Washington and British Columbia had lower quantities because the sea mud was contaminated with sediment that had reached the ocean from land. The scientists say the deposits could hold up to 80-100 billion tonnes of rare earth, compared to 110 million tonnes of rare earths estimated to be buried on land. They found that just one square kilometre of mud around one of the sampling sites could provide 20 per cent of the world’s rare earth requirements. The team led by Yasuhiro Kato also noted that seafloor derives the majority of deposits of rare earths from springs of hot fluids that pour out of vents in deep sea ridges. The elements were extracted using acid leaching. The study was published in the July 3 issue of Nature Geoscience. 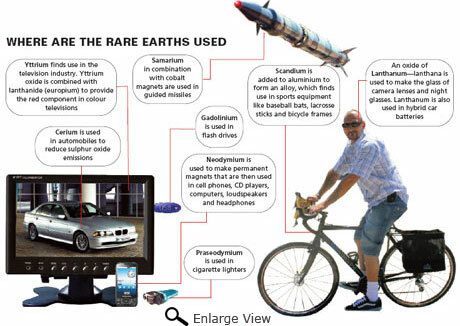 Rare earth metals are difficult to substitute. So countries are also looking at alternative sources, besides mining, to obtain the coveted group of metals. 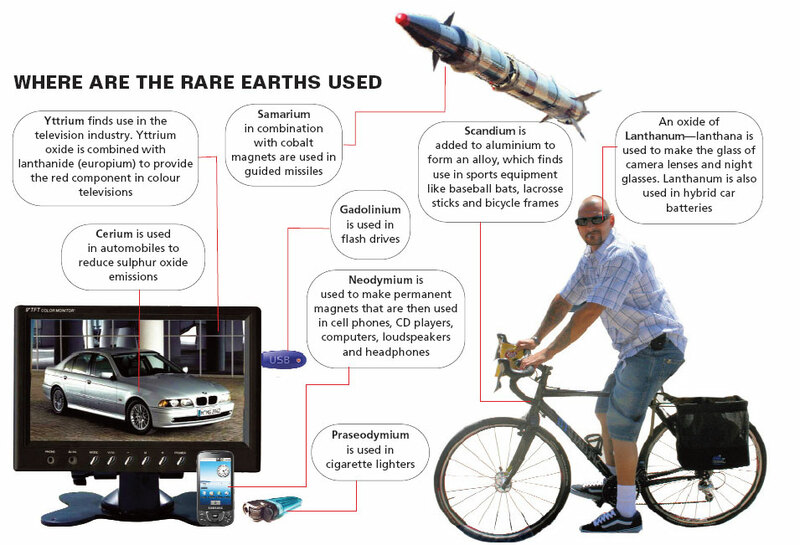 Researchers at the University of Yale in the US in a study, estimated that around 99,000 tonnes of rare earth were incorporated into products in 2007. The analysis published in the Environmental Science & Technology in June 2011, concluded if this quantity was recycled, it could reduce the burden of mining. They studied industrial data from China, Japan and the US. Hitachi, which relied mainly on China for its rare earth supply, has decided to recycle two of these metals—neodymium and dysprosium—used in hard drives and air conditioners produced by the firm. Toyota has also joined the bandwagon. It will recycle batteries used in its hybrid car Prius. The trend is catching on. Belgium-based Umicore, which specialises in refining and recycling precious metals, is recovering rare earths from e-waste disposals. A team of researchers from Tokyo University of Science has developed a motor that does not use customary magnets which require rare earth elements. The so-called “switched reluctance motor” capitalises on the difference in magnetic resistance to propel electric cars. The technology was discussed at the Techno-Frontier 2011 trade show in Tokyo this month. Despite their great use, most countries have in the past distanced themselves from undertaking rare earth mining because the process is environmentally damaging. “Acid leaching, the standard method used in extracting rare earths is expensive and hazardous,” says Pant. China thus monopolises the industry. The country’s soil is rich in europium and dysprosium, which are most important for the production of high-tech material. Even the affluent US is reluctant to dive. “It was previously uneconomical considering demand, prices for material, particularly when compared to Chinese labour rates and environmental standards,” says Green. Rare earth metals comprise of 17 elements, including yttrium, scandium and members of lanthanide series in the Periodic Table. These metals do not occur in a free state. They are found in mineral oxide ores. However, their name is something of a misnomer. While they are hard to extract, they are quite abundant in the earth’s crust. In fact, cerium is the 25th most abundant metal in the earth’s crust. 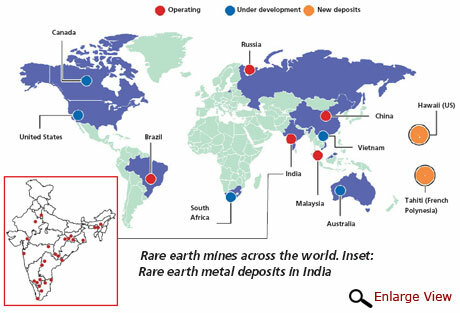 Rare earth mining in India was halted in 2004 by the centre-owned Indian Rare Earths Limited (IREL) due to lack of market competiveness. But after the Chinese move, India has decided to resume mining from this year. The government has set aside Rs 140 crore for a 5,000-metric tonne capacity plant in Odisha. It will export mixed rare earth chlorides. But around 55 per cent of the production of the plant will be sold to Japan, informs R N Patra, managing director of IREL. Other countries like Canada, Australia and even the US have also bought new mines. European and North American companies are planning to re-open mines in Canada, South Africa and Greenland. Toyota has bought its own rare earth mine in Vietnam by signing an exclusive supply deal. Thanks for this academically stimulating article! I would like add here that the Chinese monopoly over Rare earth mining has had an overarching implications on the Global Wind Energy Industry. a well written informative article.....liked it!